I’ve been very attracted to all the mixed media bracelets I’ve been seeing lately. There is something I like about the hard metal mixed with soft yarns, threads and strings. 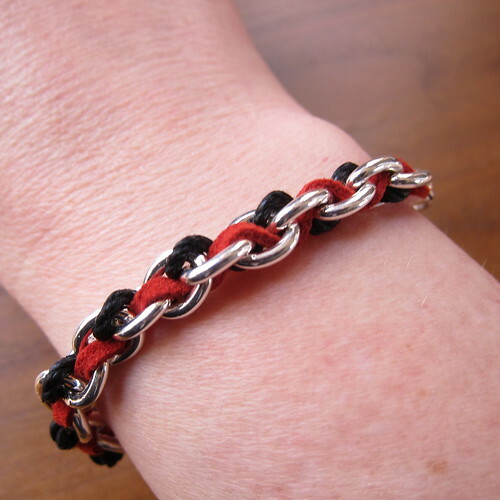 It feels like a step up from a regular friendship bracelet. I had a chunky chain I had picked up for another project that never got used, so I decided to try my hand at making my own. 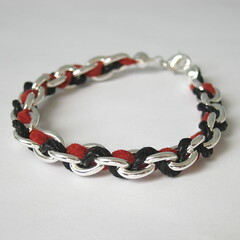 I really like the way this turned out with the silver, black and bright red. It’s so easy to make, but I seen things like this in the stores for quite a few dollars. Doing it yourself means you can chose your favorite colors or make a different one for every outfit you own. 1. 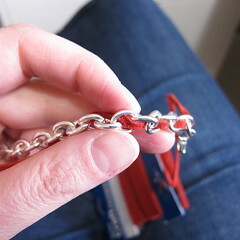 Remove the clasp from bracelet. 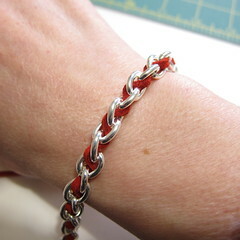 If the bracelet is bigger than you’d like remove any links until it is the right size. 2. 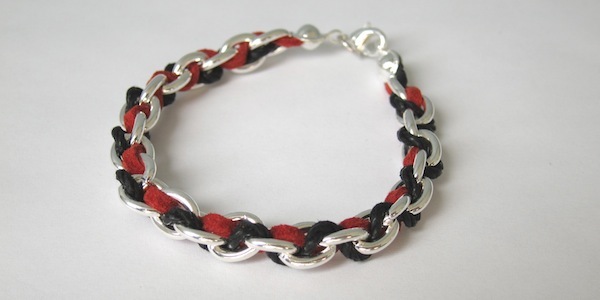 Cut pieces of the suede and cotton cord that are at least 50% longer than the metal bracelet. 3. Weave the suede cord through the links. I tried three or four different ways before I found a look I liked best so play with it. Leave few inches of tail at the beginning when you start weaving. 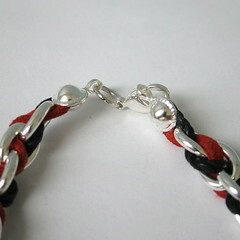 Be careful not to pull the cord too tight, you want the metal bracelet to still lay nicely. 4. Now weave the cotton cord through. 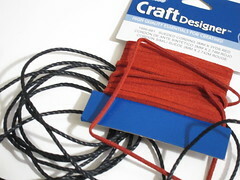 This cord has a tendency to fray and can get tricky to weave through. A little glue on the end of the cord will help stop this or you can just start with a lot extra and cut a little off as get gets frayed. You can weave this cord in exactly like the first one or do something what I did and weave it in the opposite direction. Once again make sure to leave a tail at the beginning. 5. Weave the cords so the ends come out from the last link from opposite sides. Trim leaving just enough cord to fit into the bells. 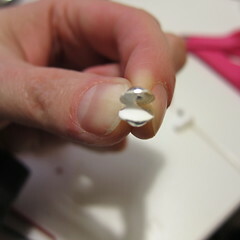 Put the cord ends into the bells and clamp closed with pliers. I wanted it to be even more secure, so I put a dab of tacky glue in the bells before the cord ends. Let dry before moving on. 6. 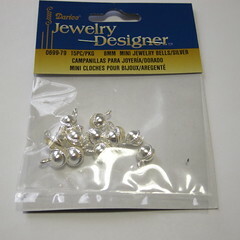 Attach a jump ring and the bracelet clasp to loop on one of the bells. 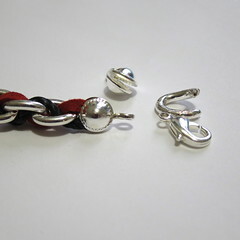 My clasp fit right into the loop on the other bell to close the bracelet. If you need a bigger loop attach jump ring to the loop on the bell. Wear and enjoy the compliments! 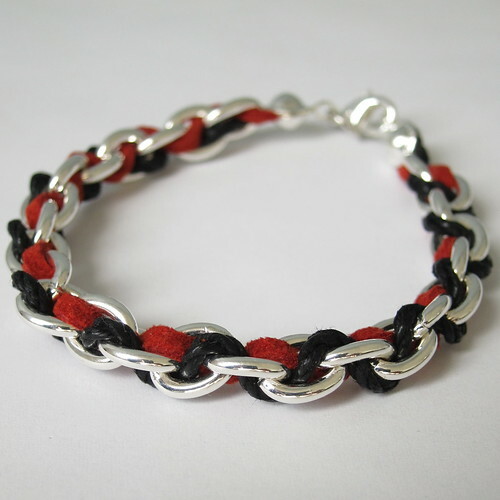 If you make a mixed media bracelet like this we’d love to see it on our Flickr group.